How did you first get involved with Boy Scouts? Tell us about your troop. Can you describe another challenging expedition? What provisions are made for medical emergencies like these? What has scouting meant to you and your sons? Outside of his job juggling academic neurology practice and committee work, Charles C. Flippen II, MD, FAAN, has tackled multiple adventures as a scoutmaster with the Boy Scouts of America. Here he discusses his steps and missteps through the backcountry of America. Charles C. Flippen II, MD, FAAN, has a full roster as a neurologist and an active leader in the field: He is a faculty member of the Headache Research and Treatment Program at the Ronald Reagan UCLA Medical Center, attending neurologist at the Olive View-UCLA Medical Center, the Richard and Ruth Walter professor of neurology, and director of the residency program in clinical neurology at the Geffen School of Medicine at UCLA. He also serves on the AAN Board of Directors, is an active member of the Accreditation Council for Graduate Medical Education Neurology Residency Review Committee and has served on a number of Academy committees. I had a short career as a scout myself for just about two years. I only made it to Webelos, the transition between Cub Scouts and Boy Scouts. When my son Charles was in first grade, he joined Cub Scouts, starting with Tiger Cubs. After that first year, I was tapped to join the leadership of the pack by one of the other dads in Charles' grade, who had older sons who had gone through Cub Scouts. He and his son decided to end their scouting career, but not before saying that I should be one of the dads leading the pack. I still haven't gotten an answer on why they picked me! Charles III really liked the uniform and building the Pinewood Derby car. So I became an assistant cubmaster when he was in second grade. The troop would go on car camping trips to Joshua Tree, and then every fall a trip to Catalina Island, where there's a Boy Scout camp. It wasn't like tent camping, but it was enough for an elementary boy to really get the outdoor bug. In fifth grade, the boys become Webelos, and at the end of that year they have to decide if they want to continue on to Boy Scouts. Charles had two friends and classmates who had gone through Webelos with him, and they all decided to join a troop. They lived in the Pacific Palisades, and we live not far from there, so they all decided to join Troop 223 based at an Episcopal church in the Palisades. It's about 80-90 Scouts strong, probably one of the largest troops in the country, with about 23 dads consistently active as assistant scoutmasters. [Editor's note: The average Boy Scout troop has about 18 scouts and only one assistant scoutmaster.] Our scoutmaster, Mike Lanning, has led this troop for more than 60 years, since 1954. He's in his late 80s and he's something of a legend in scouting. He is a force of nature, truly gifted with leading boys. He can reach any kid, no matter how rambunctious he may be. He just has a way of being able to connect. One stipulation is that every boy has to go on at least three high adventure trips involving at least 12 days of hiking and tent camping in the summer. One year we went to the Boundary Waters in Minnesota, which is a beautiful area. My older son and I backpacked the Philmont Scott Ranch in New Mexico and Spencer, my youngest, backpacked with his crew in the Desolation Wilderness in the Eldorado National Forest near Lake Tahoe. Twice we've gone to Denmark for an international jamboree; two years ago, there were over 50,000 scouts from all over the world. My older son, Charles, had already become an Eagle Scout by that time, and he went as a sort of junior scoutmaster. For my younger son, Spencer, it was his first overseas experience. We all had a great time! How has your role as a physician helped with being an assistant scoutmaster? There were two other doctor-dads in Charles' scout class, and so we split up the duties of being troop physician. It turned out to entail a lot more than I expected! In addition to bug bites and sunburn, which we got, the dads have often needed more attention over the years than some of the boys! The first year, during our annual weeklong campout on Catalina Island, one of the dads had unstable angina, and my fellow physician and I spent an entire evening getting him stabilized, providing oxygen, and getting him transported to the other side of the island to Avalon, where he was promptly evacuated to the mainland and had bypass surgery. That was just the first of several events where my medical training was beneficial to the troop. This past summer we were supposed to go to the National Boy Scout Camp in New Mexico for a 12-day trek of over 60 miles, but because of forest fires we instead did the southern Sequoia National Forest. That was an adventure. It was a hastily arranged trip, and so there were areas in which we didn't have really clear trails, and we were going up to 12,000 feet. We had to rely on our map reading skills and trail sense to pick out where the correct path was, and it was the hottest July on record in Southern California, which made water a premium item, even more so than normal. It was a very challenging experience! Along the way, one of the dads ended up passing a kidney stone and we had to call in a helicopter to have him transported out. There were rattlesnakes and scorpions. We had hail. It was quite the trek. But while we had our share of blisters and one case of sunburn, fortunately the dad with the kidney stone was the only emergency in our crew. We did have to descend 1,500 feet on shale rock without a trail, but we made it, going very slowly and at times scooting on our behinds with our 60-pound packs. One thing about the backcountry is that you quickly learn your limits, and also [to ]respect nature. Fortunately, the unstable angina case occurred not during tent camping[ but] in an established compound that had a medical facility with [an ]oxygen tank, monitors, and an automatic defibrillator. But in the high adventure trips, you are really remote. So in the case of the dad with the kidney stone, they would have to deploy a helicopter to get him out. Typically they will not do that until a park ranger has assessed the situation and agrees, and in this case it was going to take two hours for a ranger to hike in. In talking with the 911 operator, I explained that I was a physician and there was nothing we could do for the guy while he was passing this stone; it was only going to get worse. So they went ahead and sent the helicopter. Fortunately we had set up camp in an area that had a clearing nearby so you could set a helicopter down. In another area it would have been a matter of finding a place for a helicopter to put down and then getting to us. It would have taken probably an hour, even for a life-threatening emergency. There's always a risk inherent in camping; that's why the Boy Scout motto is “be prepared.” There are fatalities in the national parks every year, and they are not necessarily due to errors of omission or commission. You can plan everything perfectly, and the first thing you find out when you start backpacking is to expect the unexpected. Do you think that being a neurologist particularly helps you prepare for occasions like this while in the backcountry? As a neurologist, and I think more so than maybe some other medical specialties, we are trained to assess things logically, and that discipline in having an approach to problem-solving helps in these situations. It also helps just in planning for a trip. I'm always the guy who has just a little bit of extra duct tape. The other parents always kid me because it seems like I can always pull something out of my backpack that will help with a given situation. Once we set up camp in a sloping area, and for whatever reason I had these wooden pegs I'd put in a bundle and tied a cord around it. Using that, I was able to splint up one side of my ground cover so that the water didn't flow on top of it but went underneath it, and our tent didn't get swamped like the others. Extra batteries for satellite phones, an extra pump because water pumps fail: I'm always willing to carry a little extra weight for something that might be useful on the trail. Charles is now a college freshman, and Spencer is a high school sophomore. He just became an Eagle Scout two weeks ago. He's thinking of becoming a Venture Scout, which is the next level of scouting after Boy Scouts, for ages 18-21. It's meant so much to all of us. I've shared experiences with my sons that are invaluable. I've watched them grow and become very capable young men. Once we were kayaking off of Catalina and my wife found herself getting swept out into the ocean. Charles calmly talked her back and gave her directions in his kayak on how to get back into the harbor. She said, “This Boy Scout stuff is pretty great!” It's really taught them great leadership skills, not to panic, and [it ]gave all of us the opportunity to share tremendous memories. “Off the Clock” is a Neurology Today series featuring neurologists and neuroscientists who pursue a rich array of hobbies, interests, and passions outside of their work. Want to nominate someone for a feature? Send your suggestions (and why they are good candidates) to NeurologyToday@WoltersKluwer.com. 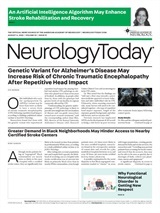 Neurology Today19(3):50-51, February 7, 2019.